Edited by Peter Gritton. Mixed Voices. Lighter Choral Repertoire. Secular, Choral Collection. Vocal score. 176 pages. Oxford University Press #9780193436305. Published by Oxford University Press (OU.9780193436305). ISBN 9780193436305. 10 x 7 inches. An anthology of 24 stunning show-stoppers guaranteed to bring the house down. Full of choral pieces arranged for SATB choir in an amazing variety of styles and moods - humorous, comforting, dazzling, quirky, sentimental, classical, spiritual... it's all there. I bought thsi book because of the subtitle "show stopping songs for choris" but was expecting mroe contempoary songs perhaps from 'shows' or musicals by well know composers. Was dissappointed - they won't suit my choir. We purchased Encores because our chamber choir (20 voices) wanted to perform "Teddy Bears' Picnic". We are enjoying that arrangement very much and are looking forward to trying several others in the book too. 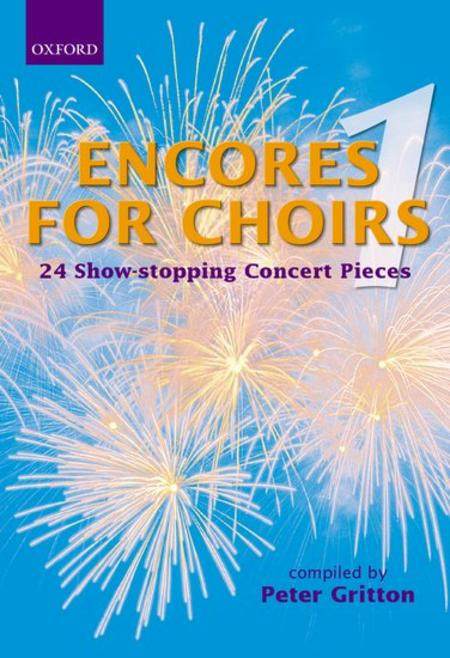 My choir has been using Encores for Choirs for some time now and thoroughly enjoy using it. Many of the pieces require a bit of effort to master but by and large the results are worth the effort. Above all it is fun to use.